Apparently, today is a busy day and 9:00 a.m. was too ambitious, especially after a long week. There are basketball pictures, baseball sign-ups, and a wrestling match this morning. In light of those competing events, we have chosen to move SNOW BOWL 2016 to 3:30 p.m. The last week has been a frustrating one. That being said, we don't have a community without "unity." Camaraderie is even more important during emergencies and disasters. That being said, we, the United Residents, deserve some fun. We deserve to laugh. 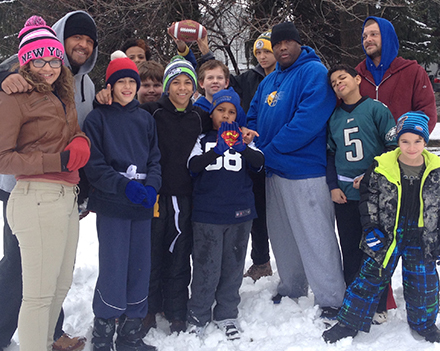 That is why I am announcing SNOW BOWL 2016, which will take place tomorrow (Saturday, Jan. 30) at Susquehanna Street. Please bring footballs, flags or long socks, warm clothes, cleats, and a winning attitude. Don't come if you're not ready to rumble. I'll see you there. This is NOT a Borough event. Rather, it is an effort to further community togetherness and continue a yearly tradition.